Large, inflatable pop-up packhouses that can be erected in less than two weeks could provide fresh fruit exporters with a new and more accessible means of achieving growth without having to invest in expensive infrastructure. Two such air domes were recently erected at a packing station in Ovalle, in Chile’s Coquimbo region, belonging to Broom Group, a multinational company with various operations including a logistics network throughout the Americas. Although these are currently being for storage of packaging material, they can also be installed at orchards to be used as packhouses, and can even be cooled down to precise required temperatures. In addition, because they are air-tight with positive inside pressure and filtered air, they meet international health requirements, with zero risk of contamination by insects, birds or other animals. With an eye on developing closer links to producers and exporters in key supply countries, as well as on securing stronger connections with the international fresh produce market, Broom Group enhanced its international logistics network earlier this year with the acquisition of global third-party logistics service provider LCL. As a result, it can employ its fleet of refrigerated trucks in Chile, Peru and Colombia to connect carriers’ equipment and customers’ packhouses as part of LCL’s door-to-door service concept. What’s more, this is a model it plans to replicate soon in southern Africa. 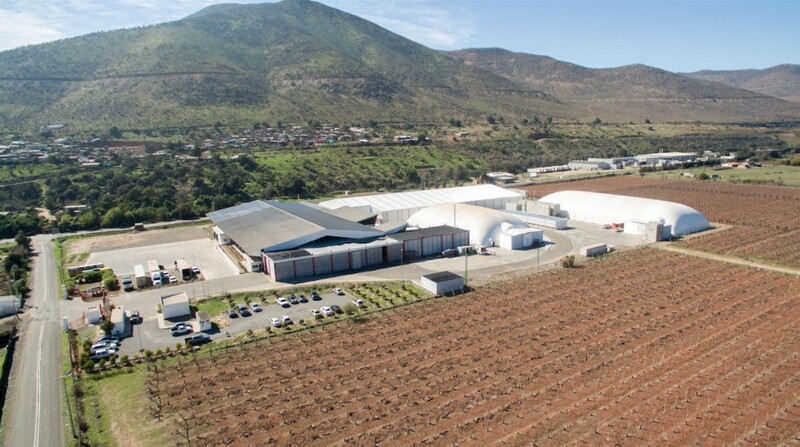 The centre in Ovalle is now in a position to handle packing and coldstorage of a wider range of products, including grapes, citrus and avocados, while offering good connections with export markets. Ole Schack-Petersen, a highly regarded perishables expert with decades of experience in fresh produce logistics, has since joined Broom Group and LCL as senior vice-president and chief strategy officer to pursue new opportunities in the sector. In fact, Schack-Petersen was LCL’s original founding president and chief executive; with four years as regional director for South America at reefer shipping company J Lauritzen plus subsequent stints at Damco and Maersk Line under his belt, he was an ideal candidate to oversee the partners’ strategic planning, making efforts to expand further and analysing long-term market opportunities. As Schack-Petersen explains, LCL and Broom Group were very much a “natural fit” when it came to working together. While Broom continues to invest in the physical cold chain itself – trucking and buildings for example – LCL provides expertise and, crucially, some excellent connections to people in the fruit business. Andrés Núñez Sorensen, chief executive of Broom Group, says the new partnership between the two operators is working extremely well. The priority going forward, he says, is to develop efficient market supply lines that producers and exporters can easily plug into, such as the air-dome packhouses. Having proven the model in Chile, Broom Group and LCL are understandably keen to replicate it elsewhere in the world, especially in other parts of the Southern Hemisphere. Needless to say, where there’s demand for dependable export networks without the need for long-term, expensive investment in infrastructure, this is a business model that has the potential to bring fresh impetus to fruit export channels across the world.